What is the first thing that you notice about your smile? If it’s a flaw like a stain, chip, crack, or gap, then we bet it’s something you feel self-conscious about every day. 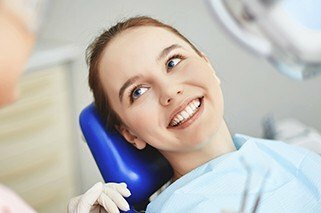 At Petty Dental, Dr. John Petty and our team completely understand how the smile’s appearance is important to a person’s overall happiness, which is why we’re ready to offer a variety of beautifying cosmetic treatments. Whether you want a minor touch-up or a complete makeover, Dr. 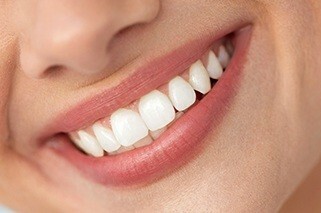 Petty will take the time to sit down with you and design your perfect smile. Then, with just a few appointments, he can make it a reality. If you’re ready to get the smile you’ve always wanted, contact us today to get started. They are actually extremely thin porcelain coverings that are bonded to the front of the teeth to improve their appearance in every way. The ceramic material completely resembles real enamel, and they are always custom-made to a patient’s specifications. They only take two to three appointments to get. During the first, you and Dr. 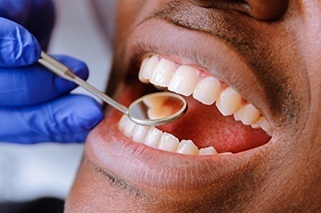 Petty will discuss what your final result will be, and once that is decided, he’ll prepare your teeth to fit the veneers, take an impression, and then place some temporary veneers. This impression will be sent to a lab to make your final veneers. Once they are ready, you’ll return to our office to have them placed. After that, your new smile will be ready for the world! The teeth that show when you smile are very important not only to your dental health, but your appearance and self-confidence as well. That’s why, should one of these teeth become damaged or decayed, we won’t simply use a metal crown to fix it. 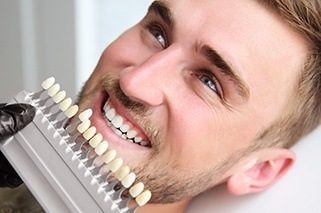 Instead, we’ll utilize a more elegant solution that will restore your smile’s strength and luster at the same time: metal-free, all-porcelain restorations. Dental porcelain is one of the most advanced materials we use every day, and it can be specially shaped and shaded to mimic real enamel in every way you can imagine (all the way down to how it reflects light). With this material, we can create a restoration that is so lifelike, even YOU will have trouble seeing where your real tooth ends and it begins! Of course, they don’t just look good: porcelain restorations are also just as durable as traditional metal ones, giving you the best of restorative and cosmetic dentistry in a single treatment. It’s amazing how just one small chip, crack, stain, or gap can completely throw off the look of a smile, right? If you’re ready to get rid of that minor flaw that has been driving you crazy for years, direct bonding offers a quick and easy solution. Direct bonding uses a composite resin that is color-matched to your teeth. Dr. Petty will apply the resin to your compromised tooth, and with his artistic touch, he will literally sculpt it to perfection. He can improve the shape, size, and even color of any tooth in just about an hour or less. This treatment is not only fast, but it is also completely painless, plus the results can easily last for 10 years or more. It offers a less permanent solution compared to porcelain veneers, but it is an excellent alternative for someone who wants fantastic results as quickly as possible. White teeth mean a lot of things in our society. According to mountains of research, when someone has a pristinely white smile, their peers tend to judge them as attractive, friendly, intelligent, and professional. It’s no wonder everyone wants white teeth! Of course, this is easier said than done, as numerous things can cause the teeth to darken and stain over time, including coffee, wine, tobacco, natural aging, and even genetics. If you’re ready to turn back the clock and restore your smile’s youthful glow, Petty Dental is happy to provide the safe and effective solution you simply won’t find in stores. We can provide you with your own custom-made take-home kit. It will consist of mouth trays specially shaped to fit your smile as well as a powerful bleaching gel. You’ll only need to use the kit as directed for about two weeks to make your smile up to EIGHT shades whiter while you sit and relax at home.